When we lived in Lansing, we had a helluva time trying to find a good pizza place. We tried almost everything from the few local places to the regional chains. We weren’t having much luck. One of the first weekends there, we tried Cottage Inn. It was ok, but it wasn’t great. It was typical chain fare. A few months later, I was out-of-town and J wanted pizza. 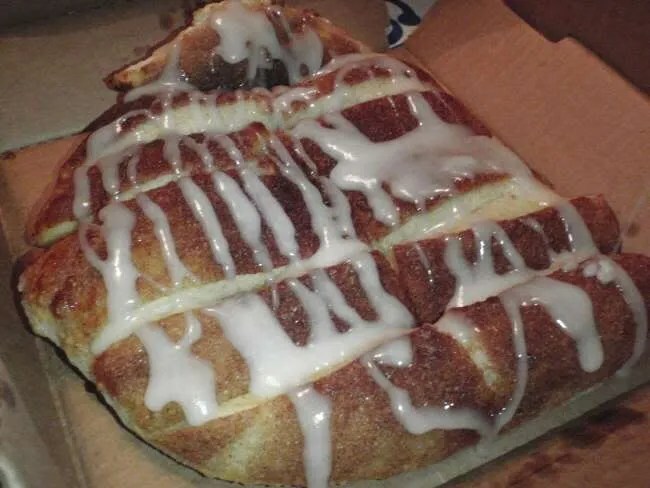 She called Cottage Inn and they offered her a choice in crust size. That was an option we didn’t know was available. J got a thin crust and from that moment on, we had our pizza place in Lansing. I don’t think we even ordered from anywhere else after finding Cottage Inn’s thin crust. I was coming home pretty late from East Lansing last night and when I called J to let her know I was leaving, she asked about dinner. I said I was fine, but I could eat if she wanted to order a pizza. I suggested she just call Bilbo’s again, but she got the idea to see if there were any Cottage Inn’s near us. She found one not too far away. There are actually three Cottage Inn locations in Kalamazoo. 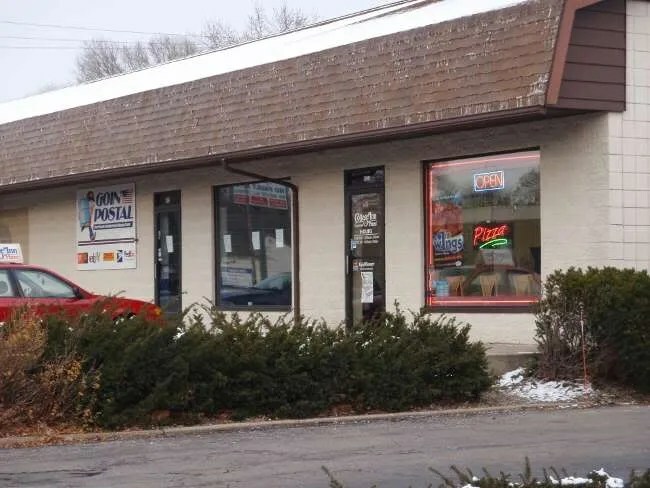 The closest one to us is the Portage Avenue location in the Milwood neighborhood. J called in the order and they told her it would be about 45 minutes. That worked out pretty good because I was just passing Firekeeper’s Casino, so the pizza wouldn’t beat me by much. Twenty minutes after ordering, there was a knock on the door. They got the pizza there much faster than expected. Cottage Inn has a meat lover’s specialty pizza that I really like, but J doesn’t, so we usually order two pizzas. That sounded like a waste to me, so I just told her to get cheese. She ended up getting a half cheese and half pepperoni pizza plus an order of Cinnamon Stix. 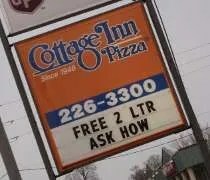 Maybe it’s just been a while since we’ve had Cottage Inn or maybe CI Kalamazoo does something different, but J said the pizza was better than she remembered. 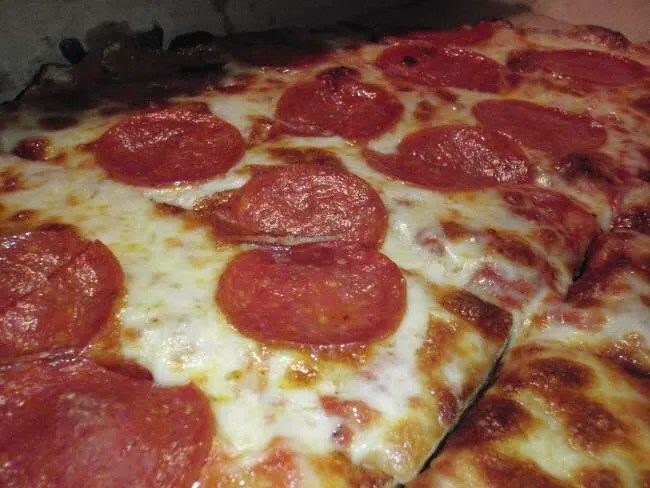 The thin crust is almost a cracker thin crust that’s cooked crispy. Then, instead of cutting it into triangles New York Style, they cut it into small squares…..Chicago style. There’s a pizza place back in the Chicago suburbs that we go to almost every time we go home. It’s not typical Chicago-style pizza. It’s what we like to call South Side Chicago-style. This pizza is so good that we’ve never taken anyone there for the first time and they’ve not said it was the best pizza they’ve ever had. Heck, J and I even had our wedding rehearsal dinner there. This Cottage Inn pizza is the closest thing we’ve found to the pizza we love so much outside of Chicago. The cinnamon stix are, I think, the real reason J likes Cottage Inn so much. You get a pretty good size package of frosting to put on them. She had to close the box and hand it to me in order to stop eating them. Instead, I was the weak one who couldn’t fight the urge and I finished them off. Before tip, the pizza and stix cost just under $20 which is pretty typical for delivery. The best thing is, we know we like it and we’re happy to have found a Cottage Inn so close to home. No, but thank you! I’ve been looking for that place and couldn’t remember where it was. Amy told me about it sometime last year and I’ve been looking for that comment for weeks.